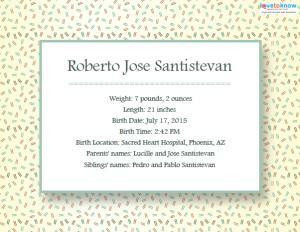 Download a cute, free birth announcement. Using printable birth announcements is a fast and affordable way to let friends and relatives know about the arrival of your new bundle of joy. When you print them at home, your announcements are ready for sending immediately; there's no waiting for printing, processing, or shipping. 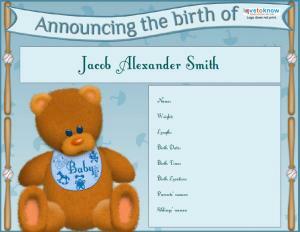 The birth announcements on this page are free for you to download, customize and print. Choose from designs with geometric borders in pink, blue, or neutral colors as well as more traditional designs that feature stuffed bears for boys or girls. You can even choose a cute jungle animal theme or a checkerboard design filled with ducks, rattles, and more. 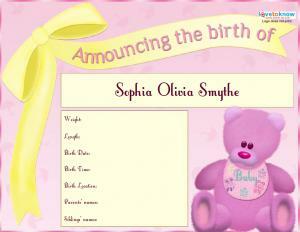 Open and edit one of the following announcements for your baby's birth. When you're ready to print, check your printer's ink levels and load heavyweight paper into your printer. Print one copy and proofread it to make sure it's perfect before you print the rest. If you need help downloading the printable announcements, check out these helpful tips. Download a blue bear announcement. Download a pink bear announcement. Download a jungle theme announcement. Download a geometric design announcement. 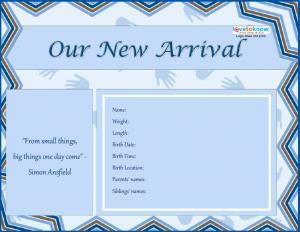 You can also find plenty of printable baby announcements online. 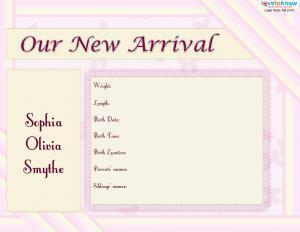 Many of these templates are customizable and allow you to change the font, wording, and even add photos. To change the look of the template, follow the directions on the screen and preview the announcement before printing. The Printable Baby has a wide variety of designs you can customize online and print right at home for a fast, friendly and cost-effective way to print birth announcements. They even have announcement templates for twins! American Greetings offers five different templates for printing at home. Your trial is free as a new member, but this site requires payment after the trial period ends. Each template can be customized for photo size, text, artwork, and photo frames. If you want an inexpensive option, consider visiting the free site Print With My Pic, which allows you to pick from one of 12 different birth announcement designs. All templates allow you to add a photograph from your computer, and no membership is required. 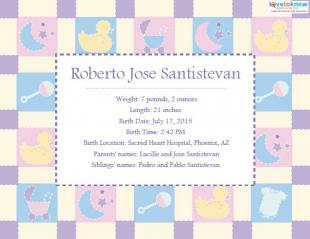 You'll find a unique set of birth announcements at Printable Birth Announcements. Print one of the free, basic templates, which include options for adoption and multiples. For a small fee, you can download a customizable template, add your details, and print it. Parents who want to create an announcement as unique as their bundle of joy may want to make their own printable baby announcement using word processing, photo editing, or scrapbooking software. To do so, simply open the size of the project you desire, and add wording, backgrounds, graphics, and photographs to make a fun birth announcement of your own. Instead of just listing the basic information, you may want to write it into a little story to include on the announcements. Customize the following to suit your needs. when Paige Marie Martinson was born at 11:06 p.m.
and was greeted by her excited siblings Frank and Sarah. You might also consider this option for your announcement wording. and now we know we'll never part. at 5:13 a.m., and was 8 pounds, 4 ounces, and 21 inches long. Many parents may also want to add a memorable saying to the card. It can be as simple as "cute as a button" or as significant as a favorite religious verse. Additionally, you can choose to include a newborn poem or passage from a favorite childhood story. When you make your announcement at home, don't forget to add a baby photo or two. A close-up of the baby's face or a full body shot is often used. Parents may also choose to include several photos of the baby with siblings or photos of his or her tiny fingers and toes. Black and white photos add a touch of class and nostalgia to a photo announcement while color photos can show off hair color to everyone who receives the announcement. 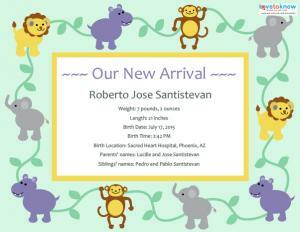 Printable announcements you can create and print at home let you share your baby's arrival as soon as possible. They're quick, easy, and customizable, which makes it simple for parents to share the good news with everyone right away.